California Coast has many beautiful beaches. It does however have a very rugged and dramatic face as well in some places. Shell Beach is one of these places where the dramatic and rugged nature of the California coast is being displayed on a large scale. In addition, Shell Beach is somewhat special because in the middle of this rugged coastline, you have access to a few small and secluded beaches surrounded by large and impressive rocks. Shell Beach makes for a special beach experience. Read on and find out how to see all this dramatic beauty. Shell Beach is a small beach front community in Central California. It is one of our favorite stops when driving in the area. Come along with me as we explore my best things to do in Shell Beach. The main attraction in Shell Beach is the rugged California coast itself. Whether you want to take pictures, or just stroll along, the Shell Beach portion of the California Coast is both dramatic and extremely beautiful. Take Cliff Avenue to where it meets Ocean Boulevard. Park the car at Dinosaur Cave parking lot, or on the street and jsut walk around. Admire the abundant wildlife around the huge rocks just feet in front of you. You will see lots of birds and sea lions. Stop at Margo Dodd park and take pictures. This is just gorgeous. Then walk a few feet along Ocean Boulevard and take the stairs straight down to the small beach below. Drive back to Frontage Road and drive north a little bit more until you get to Placentia Avenue. Go towards the ocean until you hit Ocean Boulevard again. Just drive or walk along the coast and look around. It’s very cool. There are a few parks along the way that will give you amazing views of the coast line. When you get to Ocean Boulevard from Cliff Avenue, you will notice a large open area called Dinosaur Caves Park. This is a perfect place to park and explore the amazing views of the coast. You really have to take your time and look around. Then, walk along Ocean Boulevard a little ways and you will find a steep staircase that will take you down to a small beach below. This is one very dramatic and amazing place to visit. Just take your time and see the many birds flying around and you might even see a few sea lions swimming around the area. If you have children with you, they will definitely love exploring the rocks and caves that abound in this small area. If you follow Ocean Boulevard and then Seacliff Drive, you will run into a few beautiful parks that were built especially so people can enjoy these amazing views. You will find Eldwayen Ocean Park, Seacliff Park and Spyglass Park which are just beautiful places for resting and enjoying the California Coast. Shell Beach is a small beach town right next to Pismo Beach, California. Shell Beach is so small that most people driving by on the nearby 101 freeway miss it altogether. What a shame! So, look carefully for Shell Beach Road exit sign off the 101 freeway. Once you exist find your way to Frontage Road, which is a small road running parallel to the 101 freeway. Frontage Road gives you complete access to Shell Beach and to the rugged California coastline which is literally a few hundred feet away. You have to get to Ocean Boulevard which is the road that runs feed away from the Shell Beach cliffs. You have access to Ocean Boulevard from Cliff Avenue and from Placentia Avenue. I would start with the Cliff Avenue area because there are two parks right where Cliff Avenue meets Ocean Boulevard. 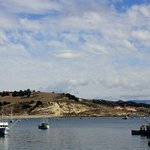 Is it worth visiting Shell Beach? Oh my! What a view! And there is another view and another one! This is Shell Beach for the first time visitor. We loved our walking and driving and exploring the Shell Beach area. Our kids were very interested in all the birds that we could see. Enough said and not much more needed to be said.